← Pollination: by wind or insect? It always amazes me how strong plants can be when they have a huge store of food underground to draw upon. 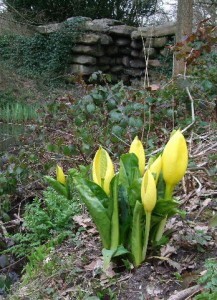 American skunk-cabbage (Lysichiton americanus) produces vivid yellow spathes behind the cylindrical spike of its rather small and insignificant flowers. These appear, with or before the leaves in spring, from underground rhizomes. The plant is a member of the Araceae family, so is related to our native Cuckoo pint (Arum maculatum). The skunk-cabbage’s natural habitats are marshes and peat bogs in North America. In Britain it will grow happily at the margins of ponds and slow-moving water where it can become invasive. It is pollinated by midges and beetles which are attracted to the skunk-like stink of the flowers. Two patches of the plant have been growing below the grotto in the wilderness for a number of years – probably a great number of years. 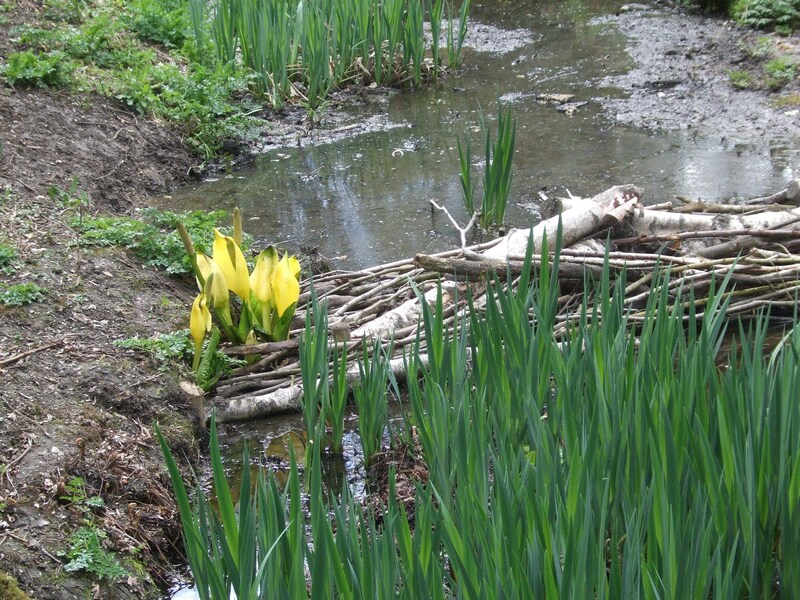 During the last couple of winters the Grounds team have been opening up this area and this spring they installed a series of log dams. One of them was placed right over one of the skunk-cabbage patches – probably while the plant was still dormant beneath the ground. Could it survive? The answer was Yes! It has forced its way up between the logs. It does look a little bedraggled but its flowering! This entry was posted in Araceae, Flowering Plants, Plants and tagged American skunk-cabbage, Lysichiton americanus. Bookmark the permalink. I’ve been watching these two patches of Lysichiton for many years. They are getting bigger now that the brambles and other scrub have been cleared away but I’ve yet to see new plants appear. Perhaps now there is more mud and open banks we might see some recruitment. A nice post Fay!